Note: The first printing has sold out—please go to this product page for the second printing! The Tome of Horrors? But that’s been done already; why do it again? Well, actually it’s been done three times, but never like this. With the advent of the Pathfinder Roleplaying Game as the newest torchbearer for the world’s most popular role-playing game, we need monsters—lots of monsters. That’s where The Tome of Horrors Complete delivers in spades. 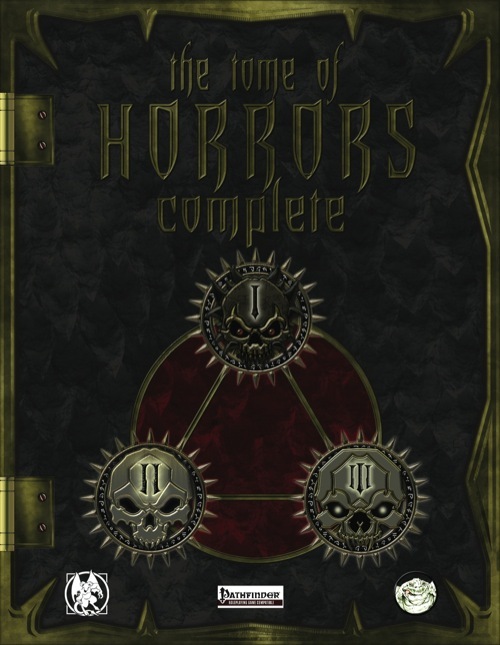 Starting from the original Tome written with the 3rd Edition rules along with the later releases of Tomes 2 and 3 for version 3.5, Necromancer Games was in the unique position to bring you updates of the classic monsters not formally released by the OGL, as well as, loads of new ones never sprung upon unsuspecting players before. So well received have these monsters been by the gaming community, that this open content has appeared again and again in game publications by other companies including updates to the Pathfinder Roleplaying Game system and even appearances in its own Bestiaries. Why stop there? Never before have all three volumes been updated to the Pathfinder Roleplaying Game in their entirety and released as a single, hardbound tome. Monsters from the aberrant to the yellow musk zombie appear in this book, and everything in between—that’s over 700 monsters. But that’s not all; the appendices bring just as much to the table from templates to hazards to a treatise on poison variations in nearly 50 types of venomous snakes. There are also new feats, planes of existence, strange beings beyond mortal ken, and plenty of charts dividing the compiled monsters by CR, type, and terrain. But it’s more than just that, because the entire compilation has also been updated to the Swords & Wizardry rules for release as another version of the volume. And in this version, the space freed up by the smaller stat blocks is filled by sample monster lairs and encounters with the hundreds of different monster types featured in the tome. Never before has this massive selection of monsters been updated and brought with these resources all together in one place for use in your own game. And before any Pathfinder players cry foul over the monster lair additions in the Swords & Wizardry version of The Tome of Horrors Complete, this lair information is included as a part of the PDF download. So you’ve got the monsters—both from the original edition of the game and new—the templates, the multiple appendices on rules, planes, and the n’gathau, and a truckload of sample encounters and lairs to throw at your players, all together in one easy-to-use book. 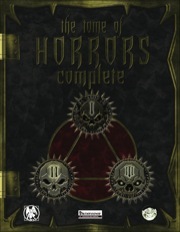 That’s why we call it The Tome of Horrors Complete! Packed full of monsters. No more will there be an issue of stale old monsters being used over and over again. Great for DM's running the older Paizo APs and modules trying to convert them to PFRPG. And with the free 127 page Lairs enhancement you have plenty of ready to go side quests and one offs. Yes. You've seen most of this before. But, until now, you had to convert oll of the awesome beasties to PFRPG. No more. 818 pages of critters from the interesting to the epic. Anyone writing campaigns for PFRPG needs it on their shelf next to Bestiary 1, 2 (and soon 3). You WILL own this. Accept your fate mortals. Well Done. Essential. Required. Yes Really. The title says it all, really. This book is a gift to us GMs. With more than 700 monsters, it's a treasure trove of coolness and it'll keep players busy for a VERY long time. While I can't tell you if a monster's CMB is correct or a monster has one too many feats as I haven't read every single monster entry in detail, I can tell you that I'll be using a ton of these monsters in my own games. As an added bonus, Paizo has used the various Tomes of Horrors extensively throughout the adventure paths, and having this updated version of the Tomes means that the book becomes super relevant for those running Pathfinder modules as well. The book itself is generally well laid out. My only gripe, and Frog God Games has explained why this is so, is that there's a wee bit too much white space in several monster entries. This is a minor gripe, however, and not something that subtracts from my overall impression. The artwork is bad to awesome, all black and white. But overall a very decent collection of artwork. This book is monstrously epic. The ooos and awws never stopped as I flipped through its pages (in the PDF). It is 10 times more then I ever hoped for. I can't wait for my print copy to arrive. The Frog Gods rock in a way that it is so epic it makes all other rocks seem like pebbles. Keep doing what you are doing! I can't wait to see what your next epic pathfinder masterpiece is. What about the people who pre-ordered through Frog Gods? I think he means that those who pre-ordered through Frog God games have not yet received their PDF, yet it is available here. From what I know, the PDF has been sent to the proper persons to upload onto their site. So it should be coming up shortly. This is a big one! It is over 200 megabytes in size. This is a big one! It is over 200 megabytes in size. Good to know. Thank you kindly, Vic! What I was afraid of was a loss of quality with the compression. It's one of the problems I had in the past doing such. As an IT profession, I find this fascinating. As a gamer, me want now! By the way, Bill is working on it! Ummmm...yeah. This was the whole reason I pre-ordered...not a big deal, but I could have just waited and ordered it from Paizo and not have waited...? Turns out you could've, but we didn't know Paizo was going to make their order until the last day of pre-orders and if they hadn't you would have been out of luck. So getting in early was definitely the safe bet. The file may be 68 MB at your end, but what downloads is about 480 MB from my end. It still opens fine though it really slows up my laptop. Maybe the personalizer needs a nudge. From Paizo or Frog God? Paizo, I just downloaded the PDF btw. BTW -> Gasp... 818 pages??? Is the binding going to hold? Also, why Slaad Lords are featured and the Slaadi race isn't? Don't ask, the legal status of D&D monsters is worthy of at least a PhD thesis. In the same vein: Beholders vs. Eye of the Deep and Illithids vs. Neothelids. Or even Githyanki, the name nabbed from a story by George R. R. Martin, according to what I've heard. It's in a collection called Tuf Voyaging. Yeah, but Giths as "psionic plane-faring race of angsty people with skin problems" are closed content lock, stock and barrel. Finally! Will this be available at Gen Con 2011? The cover looks much more fitting than the shiny good-good one you postet on FB, Chuck! And now I want my confirmation email and my pdf from froggy! Congrats to all those who didn't pre-order and have the possibility the lay their hands on this monster of a book, too! Ewwwww, c'mon Bill! I can't wait to waste an hour today browsing through this beast! Oh awesomness on a stick. Most expensive PDF I'll probably ever get from Paizo, but I'm totally getting it. I'd get a hardcopy, but I'm afraid that 818 pages of awesomeness plus binding would collapse my bookshelf. Hope these last until Friday. Can't afford it until then. I poked something on our end. If you redownload, the file should be at its reduced size. My download shows 316 meg..and I live in an area where even broadband is glacial.At this size it's going to take me longer than my system stays linked to Paizo's servers to download this.. I just tried again. It's still the same huge size for me. No reduction. Bleh - pre-ordered through FGG, and still no d/l, but I can pay Paizo and get one right away? This is not particularly great customer service, IMO. We're trying to figure out why it keeps reinflating. I'm fine with the 400+ MB size for use on a desktop, but I'm not going to transfer this to my tablet until the smaller version comes out. Adobe Reader has enough issues as it is on Android with 20MB PDFs. I've taken a quick browse through some of the PDF already, and I'm liking what I'm seeing. I'm definitely going to get some use out of this in my games :D.
Apologies on the delays for the FGG downloads. They should be ready today or tomorrow according to our digital guy. Bill is staying on top of this. Unfortunately, Paizo is making us look bad by being so doggone good. Not knocking them, of course, but we're not in the same league as a company nor do we pretend to be. FGG is Bill and a few of us running things from our home computers. It's not a customer service issue (believe me, we love our customers like crazy, we couldn't do any of this without you guys! ), it's a limitation of resources issue. Paizo has a dedicated digitial staff and we've got a guy who freelances ours for us. It's simply the economy of scale at work here. I wish I was enough of a computer guy to trouble shoot this for everyone (and Paizo has been super generous to help us out with their secret processes) but we're stuck with what we can do and how quickly we can do it. We're a Pop Warner football squad standing in direct comparison on this particular issue with the New England Patriots (sorry, Erik, I meant Minnesota Vikings), and it makes us look like a bunch of little kids running around with football helmets that are too big for us. At the end of my rousing speech I wish I could close with "And now it's ready to download!" but it isn't and won't be until our computer guy gets it up and working (today or tomorrow he tells us). That's not a commentary on the quality of our products or our dedication to our customers, just a reality of our technical resources. So all I've got to offer you at this juncture is our apologies and assurances that it will be coming to you and it is our priority for it to do so. Believe me, we're more excited than anybody to get this out the door. We're not as slick and as fast as Paizo and we won't ever be. We're the old guys in the room complaining about our aching backs when we get up from the sofa and Paizo is those pesky kids who won't get off our lawn with their golderned fancy computers and rocket cars. I assure you our goal was never to have the pdf go to the nonpreorders before the preorders, but that bit is out of our control since we're not the ones distributing it to the nonpreorders, Chuck made the pdf available to all distributing parties as soon as he finished laying it out, and I know it's frustrating. But it is coming, and well ahead of the print release which is what we promised, and all I can do is ask for your patience. Again my apologies for the extra wait time you have experienced. We hope that the end product will be worth it for you. Thanks for the update Greg. While I am super excited to finally get my preordered copy it gives me a chance to read more of Ultimate Combat so I can design a nice flying vehicle that will be ready to populate with new monsters from the Tome when I get it. I'm not worried about PDF download. My computer has enough problems without it getting possessed by the awesomeness that will be Orcus. And great Patriots reference by the way :). Eloquent as always, Greg. I was struggling to come up with a way to say to folks that we do the best we can with our resources, and that the folks at Paizo are just plain awesome with their resources. I never thought to use a football analogy. That is just brilliant. I feel like the sports mom in the stands wanting to hollar at our poor kids in their oversized helmets to do better against that pro team, knowing full well the kids are doing the best they can. Apologies on the delays for the FGG downloads. You make it hard to get mad over, but I am super anxious. At this point I would mostly like to be reassured that the file size can in fact be reduced. The Pathfinder Core Rules pdf weighs in at a sleight 77,397KB for all it's whopping 578 pages. Certainly there must be something that can be done about the 400MB file size. The Frog Gods download is available from the @bytes server! I followed the email link that I got when I first ordered. 250MB, downloading now. I was going to complain that it wasn't working for me, but then I realized it was under the 'ezines' link instead of the 'download files' link after login. I missed that too; thanks!